I am not very good at keeping my website totally updated. I would rather be Turning in my shop! So, as always, please feel free to contact me if you would like something you don't see. I may be working on it. I'm currently adding glass to some of my work as I now have a kiln and torch to melt glass. 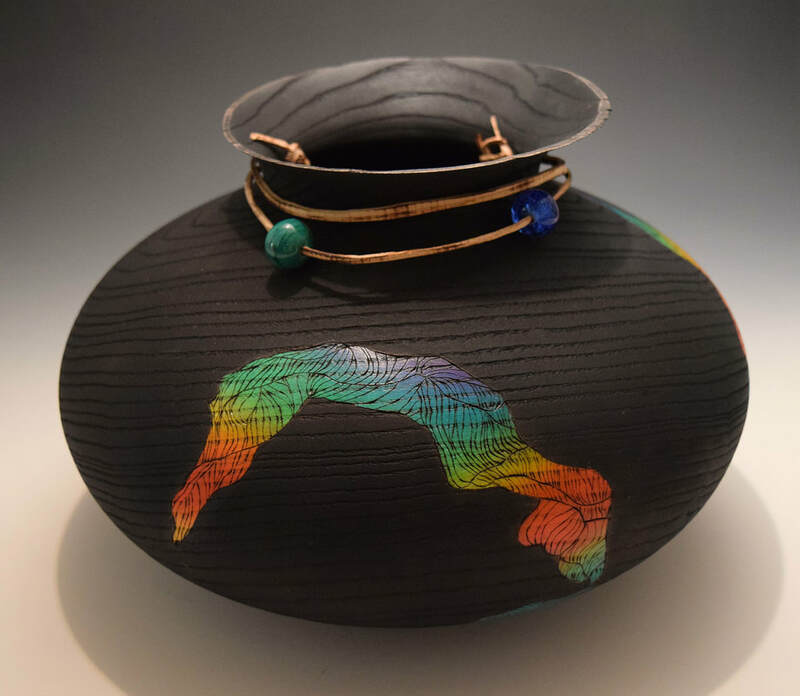 Look in the Gallery section for a small sample, "Beaded Olla", "Rainbow Olla", or "Reflections". Artistic Wood turnings from my life experiences. Hopefully they will inspire your own thoughts and experiences of nature. All wood is found wood. Meaning it is wood that is exotic or wood that is from felled trees. Each piece of wood is chainsawed into manageable blocks and mounted on a wood lathe. I use various chisels to form the wood in ways I see the grain develop as I cut. Sometimes pieces are hollowed out. This is done by feel and practice as the wall thickness ends up between 1/8" to 3/8"
depending on carving that I may choose to do. Please feel free to contact me for any questions you may have, or to purchase a piece. Some of the pieces on this web site are currently available at various Galleries for purchase. Check with me or look in the Links section for current galleries. Sold, but more availble. Please call. Maple, Bleached, Carved, approx. 13in tall 6in wide. 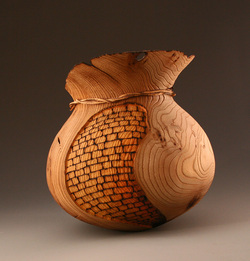 Available from the American Association of Woodturners Exhibit, "A Walk In The Woods". A juried selection of 27 pieces from around the world! It will be on display in San Jose California beginning June 7th, during the AAW Symposium. After that time, it will travel to Minneapolis Minnesota at the Landmark Center until December of 2012.